These printable datapads have seen extensive use at my game table, and I've finally put them together in formats that should be useful to everyone. 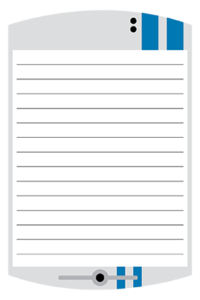 The download is a zip archive with 4-by-6 inch printable index cards that fit on letter or legal paper. There are also versions that print A6-sized notecards on A4-sized paper... If you live in the rest of the world where paper does that cool resizing-ratio parlor trick. Printing instructions for presets are included in each document. Weights/densities of paper equivalent to stiff, sturdy index cards one can buy in an office store are also specified in these presets. I recommend that those who, like me, use US paper sizes use the legal paper version if they can: it fits four notecards rather than three and most print shops here charge the same for a copy made on either size. Americans may be stuck with letter and legal paper, and the former doesn't fit a 4-by-6 inch notecard very efficiently, but you'll have to pry those points, picas, inches, and factors of 12 from my cold, dead fingers. 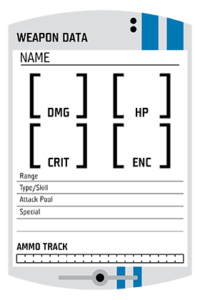 The datapads themselves are designed for stat blocks: minion groups, vehicles, and weapons. Minion groups in particular are useful at the table. With open initiative, it can be tricky to keep track of both how many slots have been used and which NPCs have used those slots. If your minion groups are on these datapads/notecards, however, just flip each one over as that minion group acts. 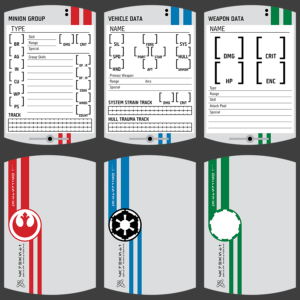 Vehicle cards can be used in the same way during space combat. There are also datapads with nothing but lines or grids (shown below) for writing or drawing anything you might have in mind. 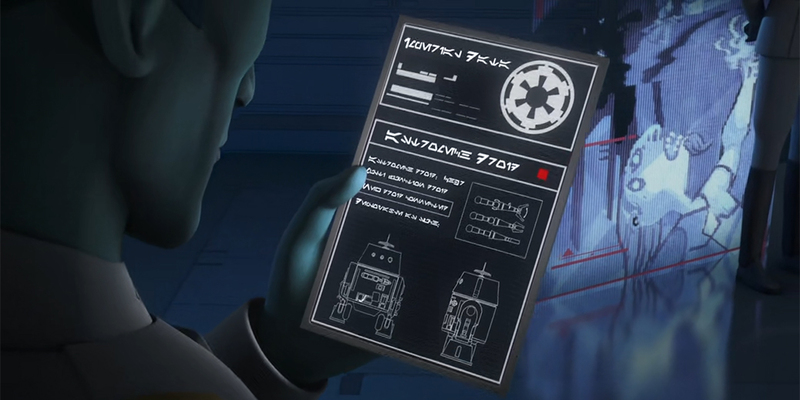 Included also are alternate reverse-sides to the datapads with Rebel, Imperial, and neutral logos. 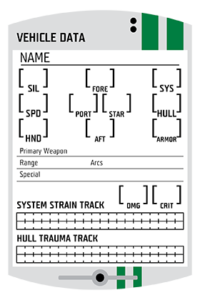 I was originally planning to make a full page vehicle sheet, but between these datapads and my Unofficial Character Sheets with their half-page for a vehicle, I think my time may be better spent working on new content for Genesys. Feel free to leave me any feedback or questions in the comments here, on reddit, or on the FFG forums. These are great! Thank you for sharing them. Do you have any recommendations or guidance for laminating a set once it’s been printed? I’d like to have a mostly-permanent set that I can use with dry erase markers. The two methods I’ve used in the past are cut-laminate-cut-again and the simpler laminate-cut. The former process has an extra step, and you have to fit the 4×6/A6 datapads into your laminate sheet manually, making it more time consuming. The latter process requires that your uncut page fit within the laminate sheet, which may be a problem if you’re using the legal paper template. The datapads made with laminate-then-cut, without that initial cutting step, tend to peel over time. I’d recommend cut-laminate-cut-again as a process. It’s less wasteful of paper and laminate sheets. Though it takes more time, the result is sturdier. Also, laminating means that using heavier weight paper is less necessary, whichever above method you use to prepare the datapads.